... my home on the information super-highway. 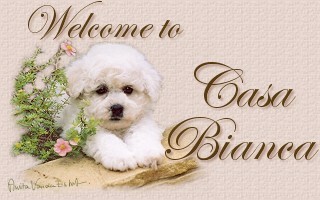 movies, was the inspiration for Casa Bianca!. In the early 1900s, Casablanca became a center of French influence in Africa. The French have had a great influence on the Bichon Frise breed too, having started a controlled breeding program after WWI. You can find out more about my ancestor's colorful history in Viva Bichon! and I am happy to share with you some photos of my pals. So fix yourself a cocktail, sit back and enjoy your stay at Casa Bianca! when I was a teeny-weeny pup! do sign my guestbook or invite another friend to visit. My webpages are made possible thanks to the beautiful graphics & websets from Aunt Anita. copied or reproduced (in part or in whole) for inclusion on any other website or literature. Copyright © 2003~2006.